Yoga+Music(not quite 365) Infinite Light by Lightning Dust – Recipe Edition! Guest Post! I’m thrilled to announce that Teacher Goes Back to School has its very first GUEST POST! Today’s recipe and divine food photos are from Vanessa over at The Beet Goes On and Good Things Come to Those Who Wait. I’m all for food that is easy to prepare. Maybe not so much the frozen pizza rolls, exactly, but more like a hunk of bread spread with soft goat cheese and topped with strawberry jam. Or roasted vegetables, which require so little preparation aside from a few swipes of the knife and a dousing of olive oil and salt before they go into the oven. A roasted chicken. Perfectly ripe strawberries that require that you do nothing but wash and savor. So when it comes to fava beans, a most delicious reason to love spring, I sometimes hesitate buying them. Each little prized nugget is wrapped in its own protective little sac, and then those little sacs, say 5 or 6, are nestled into a large, leathery, fibrous pod. Getting to the sweet bean itself requires some combination of peeling, shucking, poking, cutting, squeezing, prodding, tearing, pulling, pinching, and extracting. It’s not difficult work, but it’s repetitive and can take a while. It’s the kind of project to tackle when you have a podcast of “This American Life” you need to catch up on or when you’ve got someone who can lend another set of hands and some conversation. I usually slip into a quasi-meditative state as I hit my shelling rhythm– but only if I’m not hungry when I start out, or all I can think about is shoving handfuls of favas into my mouth. An armful of the whole pods might yield just a few cups of beans, but those beans are worth all the effort that go into them. They’re firm but kind of creamy, buttery but kind of green and bright. And though not the most convenient of foods, the reward for the work is big– and delicious. Here’s a simple recipe that really allows the favas to shine. This method of roasting the beans whole and then shelling them is a little easier for me than shelling the beans raw– with the skins softened a bit, they’re a bit easier to manipulate. Rinse and dry the fava beans. Put them on a rimmed baking sheet large enough to lay them out in a single layer. Toss them with about 2 tablespoons olive oil. Roast the beans, tossing them once during cooking (tongs are helpful for this), for about 10 minutes or until the shells begin to wilt. You don’t want too much color on them– just a slight change in texture. Plus the residual heat will continue to cook the beans after they’re out of the oven. Season the favas with the lemon zest and juice, sea salt, a few grinds of black pepper, and 1 tablespoon of olive oil. Toast or grill the bread. Evenly distribute and spread the ricotta over the toasts, then divide the favas evenly over the ricotta. Today’s music is Infinite Light by Lightning Dust. A big thanks to those who came to my and Donna’s class last Friday! Always an honor to practice with you. I’m teaching with Erin – May 28th! I’m also scheduled to teach July 9th! This entry was posted in A Yoga+Music365 Project, Guest Posts!, Recipes, Self-Care and tagged Fava and Ricotta Crostini, Guest Post by Teacher Goes Back to School. Bookmark the permalink. 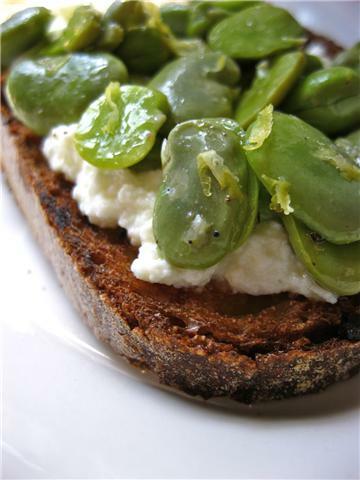 I’m digging all these fava bean recipes I’ve seen lately– and one with bread and ricotta?! I’m sold. Can’t wait to try it! 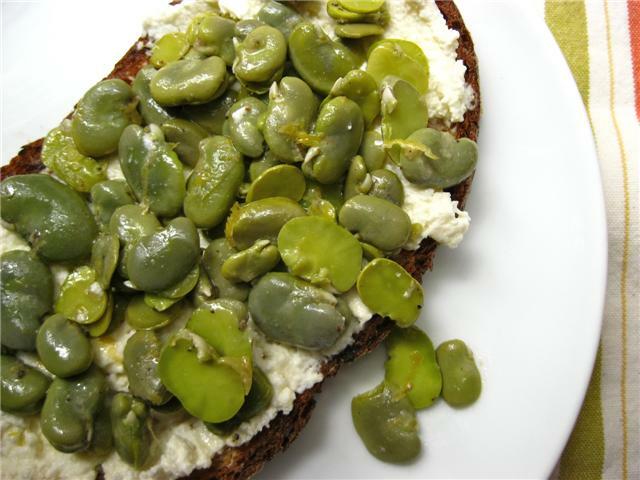 We can’t plant Fava beans around here (Pacific NW) until late spring, not enough sun; but before summer is over we will have a good harvest and I will be sure to try this recipe…I love Ricotta and Fava, what a combo. Thanks Vanessa for sharing your recipe the instructional pictures are beautiful, a wonderful recipe…a keeper! Thanks to Teacher Goes Back to School for inviting her to share! What a delicious looking treat! I may just have to try this one. 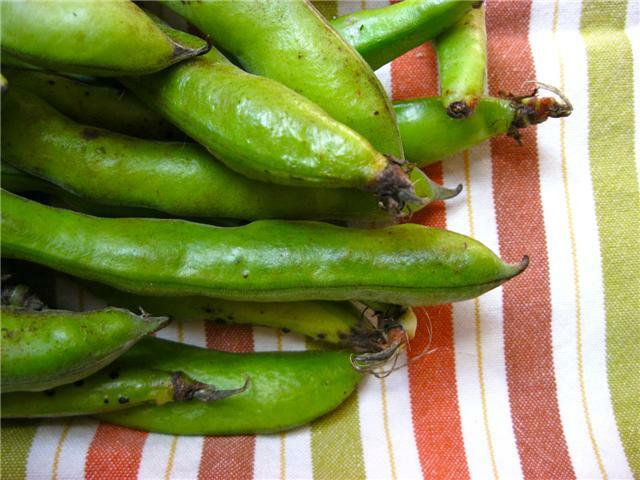 Tell me – are favas much like limas? There aren’t many vegetables/legumes I don’t like. Limas just happen to be one of them! The favas look so beautiful, I can’t fathom not loving every morsel. Thanks for the post, V3! 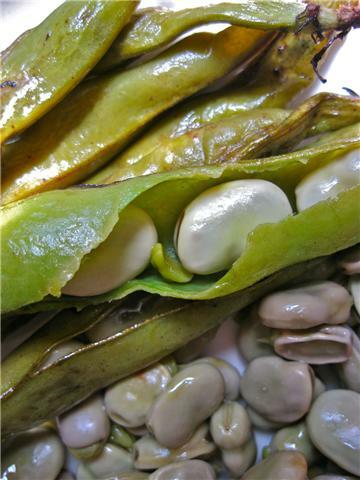 favas and limas are two different beans. favas are a firm bean with a firm consistency throughout, not like limas which often are made so the skins are thick and insides are mealy. thanks, steph! i look forward to hearing about your new fava obsession. but get on because the season’s short (and i’m not sure how they’re looking in california right now).